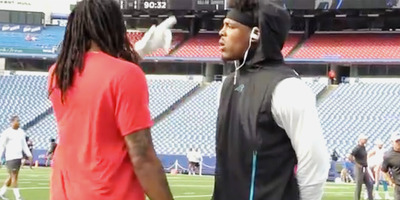 Via the Charlotte ObserverCam Newton and Kelvin Benjamin did not appear to have a friendly exchange on Thursday. Former Carolina Panthers wide receiver Kelvin Benjamin had harsh criticism for Cam Newton in a recent interview, calling him inaccurate and un-knowledgeable. Before a preseason game between the Panthers and Benjamin’s new team, the Buffalo Bills, Newton appeared to want to talk to Benjamin about his recent comments. Their reunion looked awkward, and Benjamin did not seem to want to talk things out. Carolina Panthers quarterback Cam Newton and former teammate Kelvin Benjamin had an awkward reunion before Thursday night’s preseason game, after Benjamin publicly criticised his former quarterback. “If you would have put me with any other quarterback, let’s be real, you know what I’m saying?” Benjamin told Tim Graham of The Athletic in an interview last week. Newton has not said much publicly about Benjamin’s comments. But he appeared to be upset with Benjamin, based on video of the pair’s encounter Thursday night. Video from the Charlotte Observer showed Newton attempting to talk to Benjamin, who did not seem up for talking. As Benjamin walked away, Newton followed him, continuing to talk, before going his own direction without much in the way of a goodbye. Benjamin was the Panthers first round draft pick in 2014. Initially, he and Newton looked to have a good connection on the field, and were also known to be close friends off of it. But an ACL tear forced Benjamin to miss the entire 2015 season, and he was never really able to make good on the promise he displayed as a rookie after that, ultimately getting traded to the Buffalo Bills midway through the 2017 season. Newton, for his part, seemed pretty accurate and knowledgeable when Benjamin was out in 2015, winning the NFL MVP award and leading the Panthers to a 15-1 record and a Super Bowl appearance.